About I Found three very young Burrowing Owls running around the Railroad tracks In Fremont, CA. I am posting this first as I thought It was a nice change of pace for me. Thanks for looking. What can i say that hasn't already been said ? WORLD CLASS IMAGE !! Belongs in Nat Geo or Smithsonian magazines, or any other top publication ! Outstanding work ! Outstanding capture, DOF and composition, just superb image. I do landscapes much more than so than wildlife photography. I can honestly say I have not seen a more creative and appealing wildlife shot anywhere, ever. This has enormous sales capacity and must surely be a contender for Wildlife Photographer of The Year. If you haven't entered it already you most certainly should. The reflection of the owl in the rail is what takes it to such a high level. Congratulations, it's a great capture. I love the reflection. Wow! Very cool shot!!! So worthy of all the awards and comments! Thanks Richard, this was one of thouse lucky shots that just happen, really didnt plan it..
Like this one very much, great shot. are you kidding me !!!! ... lets not talk about the photo as much as how much did you wait on the railway !! This is Brilliant...at first I thought...this can't possibly be real...its a composite of 2 shots...really fantastic! Cheers and well recognized! What a funny tiny Owl, just watching me and keep guard. Well captured shot. Very well deserved awards. Hey Marcus, congrats on your award. Wonderful shot. It's actually cool how something gets noticed over a year after being uploaded. Great image! another feather in the cap ! this is an amazing shot with a great sense of timing, truly an award winning stuff!! best photo ive ever seen . what a great capture , well done mate . hope your well !! is that a real bird?! wow! Take care and how is Shady? Beautiful! He looks exactly like an owl we got! Went into the pet store to get some cat food and found this owl to skinny fatherless and pretty aggressive, since there aren’t any wildlife rescue shelters in my city we bought him and took care of him now hes growing feathers and eating small white mice perfectly! Its so nice to see a picture of the same breed! We don’t have them here in Saudi and I was wondering which breed he was! do u have a website that we should visit to learn more about it? Well, it is really fantastic capture!!! Congrats, on well deserved award! Absolutely perfect! Excellent capture, my friend. Congratulations! superb marcus , i love this photo , well done on the awards , well earned , hope your doing ok mate ?? This is a FABULOUS image! I absolutely love it, and I've come back to it several times now...I even had to get my husband to come look. 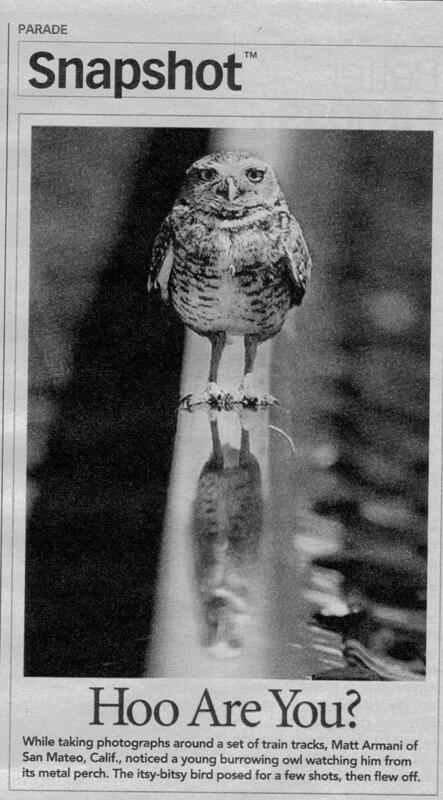 I can't believe the good fortune to come across these owls on a railroad track...great capture! Congrats on the awards...well deserved!! That's very well done. You establish the track at the bottom, and then dispense with it. You capture the reflection, and what almost appears to be a pose. That is, the bird almost seems to be communicating. And the track then vaguely suggests a tail and exits right at the frame corner. It's a perfect construction. All that's in focus in the shot, should be. Everything that should not be there has been removed, as it were. Wonderful - love the simple composition and how the dof fades out. Fantastic reflection. Off to Gambia next week - not a twitcher but love this shot. Amazing shot Marcus...so glad to see you with all of these well deserved awards...excellent work!! To get the owl on the tracks is not easy, to get him posing for you and to get a reflection on the tracks is VERY unique!!!!!! Never seen this before!!! I'm impressed! CONGRATULATIONS. wow excellent shot! i'd never heard of an owl playing 'chicken'! You've got really fantastic portfolio. Hola Marcus.,..certainly you have great bird pictures. All of them are excellent. Congratulations.I kept this one as a Favorite. saludos...and thanks for visiting my portfolio too. Hi Derick, thanks very much for what has to be the most flattering comment i have recieved here in 3 years! very much appreciated. what can I say !? Marcus, I have looked through a LOT of pictures on this site, and this is far and away my favorite image. Congratulations on this amazing shot! Marcus this is such a fabulous shot and congratulations on being published! (I saw the foum thread). You have great talent with these guys (the birds I mean) which is obvious in this shot. Isn't Armani also famous for designing dresses, too? Or is it cologne? Thanks Paul, how are you? I was going to hit your portfolio later tonight as I do my friday night thing, I didnt tell anyone about the parade thing, but did recieve 250 requests for photo purchases, so Im rather happy, hey keep the Matt quite LOL Thats my real first name, Matthew Marcus..
20 favourites speaks its own powerful language! A fabulous capture; you even got the full reflection ~ very well done! This is a fabulous picture. Unique and really cute! I knowe it is CC. I just can't make any suggestions. I love it as it is. Congratulations on DIOD. Fabulous shot, Marcus! Love the reflection. Brilliant composition, very creative reflections in the foreground. Certainly another favourite. i like it v much & i added it to my favorite. Excellent idea and realization !!! Bravo !!! This is a great shot. Well deserving of the DoD award. Easily a favorite of mine from your previous submissions. Hi Marcus, tks for visit me again. This Picture is so perfect !!!!!!!!!!!!!!!!!! And what a lucky! This is very cool. The focus used is spot on and the reflection achieved adds another dimention to the shot. Nice work and congrats on the award. I am adding this one to my favorites. Focusing is so clear and congratulations for "Donor Image of the Day"
Marcus, Another great shot from you. Love the composition and its very unusual image to me . Great work here. Have been looking at this solidly for the last five minutes, keep wondering how on earth you got him to do that.... Great reflection, dof and comp (all goes without saying), there really isn't anything here you could possibly edit or do differently. 100% perfection. Absolutely LOVE this shot....amazing capture....I am awed by you once again!!! A change of pace alright Marcus - staying there for 10 minutes to give you time to compose & shoot - very different from your normal millisecond reaction times. Wow !! Great shot Marcus . wow, this is such a great shot!! incredible!! I hope he is not waiting for the train and wanting to end his little birdie life! What a unique capture! Love the reflection and you definately had his attention! Marcus, definitely a great one. The reflection, the fading rail, the unsymmetry in the symmetry, everything is exceptional. Congrats for the award. Hopefully he is going to jump before the train comes back!!! Congratulations for this very creative image and for a well deserved award. BTW. Thank you very much for letting me know their location. I always appreciate your kindness. Unique view, not an opportunity you get all the time. I just want to know how much you had to pay that poor birdie to risk life and limb like that. Hi MArcus - Very different from your normal shots but equally powerful. Great use of selective focus, perfect angle. Well done and congrats with the DoD! Another stop by to congratulate you for the award on this. Only 21???? The judges must be sleeping!!! LoL! stunning. marvelous capture.magnificent. congr.for the DID. fascinating. what an exceptional image!!!! the reflection is fantastic so is the DOF!!!!!! not "nice" change but "remarkable" change!!! Just wanted to say congrats on the WELL DESERVED DOD!!!!!!!!!!!!!! Happy for You My friend!!!!!!! My congrats on your DoD award Marcus! Oh, Marcus, for the last few hours I've been meaning to send you a note of CONGRATULATIONS! I was so happy to see the judges award you a DOD for this one!!!! Mate, this is one top notch, superb image! When I saw it last night (Australian time), I was blown away by it. I went to nominate it for an award, however, Roby had beaten me to it! So, once again, congratulations!!!! It's a stunner! ooh this is superb, love the DOF!!! Oh my dear!! This is really beautiful! nice view with great composition...I really like it! super :) I like IT! Wonderful image, dear Marcus ! 7 ! The green Label "DIOD" is a minimum acknowledgement to this hot shot. Marcus,congrats for your 21st award!!! ...well deserved for seeing this,acting quickly to shoot and for do such a good job! Right on,dude! Excellent use of dof Marcus,a once in a blue moon capture.Congrats on the award,thoroughly deserved.About time A Wildlife photographer get one. Little left to be said, excellent! This is adorable, Marcus! What are the chances of coming across a scene like this??? The reflection makes the shot! Excellent!!! Marcus, this has to be one of the most unique bird shots I've seen on here! Great detail on the owl, and I love the reflection in the rail! LOL...what a great whimsical capture,homie!...the expression and placement on the rail cracks me up! ...cool reflection,dof and well composed...already saw it in noms,so good luck! Bet you were thrilled when you saw this...too cute! You must have known you had something very special with this shot!!! I don't need to comment on the reflection, composition, clarity or humour. Everyone else already has. This is an award winner for sure! Like you say, there is a certain departure, but your trademark "predator stare" is still the focal point and makes this a "Marcus Armani" image. Great job on this one Marcus! have all the best my dear marcus.. Thanks Roberto coming from you this means very much to me! you are a master photographer. The POD thread does not seem to nominate nature photos for awards very often anymore, but i can always hope LOL.. take care my good friend..
ohhhh.. another masterpiece.. favs dear marcus, you have a great and stunning work! This is a clear departure from your usual postings. I think you have captured something here, something that tell us a bit more about you as a photograhper. The track fading off into the distance. The owl staring at the camera. Where has he come from and where is he going? This is an image about journeys and travelers. Normally when the image under judgment, actually the judgment goes to the photographer. This is a priceless one can be not repeated. Do you participate in photo contests? if you do this is a wining image. 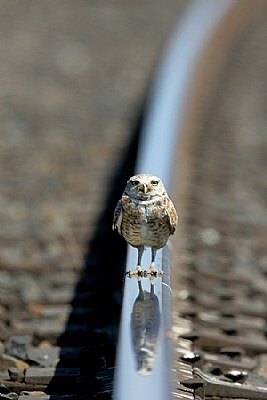 Oh wow, this one is great Marcus - and makes me laugh seeing this owl on a railroad track. Superb clarity and wonderfully composed - best of all, you caught it's reflection on the tracks - excellent touch! Hey buddy! Now this is what I call creativity with birds! Very stunning shot, nice play with DOF, lines and lighting!The reflection you've captured is just marvelous. You sure are taking this to the next level. Would you take a 7 for this one??? Beautiful! Love the dof and the reflection. Indeed different from the rest of your work, but such effective pose. I like it! Just gorgeous....I really like this image. Amazing shot, Marcus. As wise an image as the owl, that is, Minerva, the Greek deity of sapientia. Congratulations, with every letter. Incredible! Amazing shot, with superb details and GREAT use of DOF! Wonderful perspective my friend! Great work for you! All the best..
Really awesome photo Marcus!! To get the owl on the tracks is something, to get him posing for You WITH His reflection on the tracks is VERY unique!!!!!! The dof is teriffic! The clarity is outstanding! Overall a wonderful photograph Marcus!!!!!!! extraordinary shot!the reflection adds to its beauty!let me guess he is waiting for the train for his relatives visiting or he got lost:), or hes simply sunbathing ?very cute make me wanna pick him up and take him home wid me :). Well done on a fantastic capture. Looks really really good. Nice reflectons and DOF.